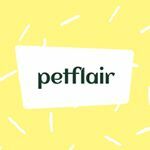 Petflair is custom made swimwear featuring your pet! 25% of profits gets donated to help re-home animals via Pound Paws charity. Help us raise awareness about the importance of choosing to adopt instead of shop 🐶.